A kitchen worktop represents the stage upon which most action of food preparation takes place. Do not consider it as an ingredient in the molded bulk of the kitchen cabinet. You’d rather treat it as an independent entity with its own character that has to be mixed and matched with the body and front of the cabinet to give a smart integrated character. You should think of the material, pattern, and color of your kitchen worktops. But, as the material defines the availability of patterning and coloring, it will be your first consideration and the theme of our interest in this article. The popular taste tends to the natural stones like granite, marble, and limestone. The advantage of natural stones is the easy shaping and patterning. First, granite is so popular because of its matchless beauty and smoothness; it is available in many colors and can be shaped giving, for example, curved worktops. Besides, granite worktops are functional due to sturdiness and easy cleaning. But, they have to be sealed now and then to avoid stains. Second, marble gives you charming, radiant worktops which impart light to the whole kitchen. Also, marble is a cool stone which makes your top resist heat and not expand or shrink with the change of temperature. The problem of a marble worktop is that it easily loses its glamour when exposed to any stains, and even sealing is not a solution. Third, limestone is known for its impurity which is not a defect as the minerals in this kind of stone give it special delicate shapes with specks, swirls, and pitting. 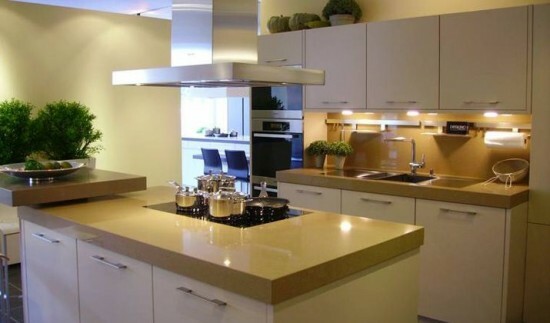 It is available only in light colors as cream and beige, so it fits small kitchens. What really gives it a credit over granite and limestone is the true easy cleaning; it may need sealing just once or twice a year to keep the beauty of your worktop. Another trend which is traditional but not less popular is wood due to its eco-friendly nature. However, it needs a special treatment for cleaning. Wooden worktops should be treated regularly with Danish oil to form a water-proof barrier against stains. 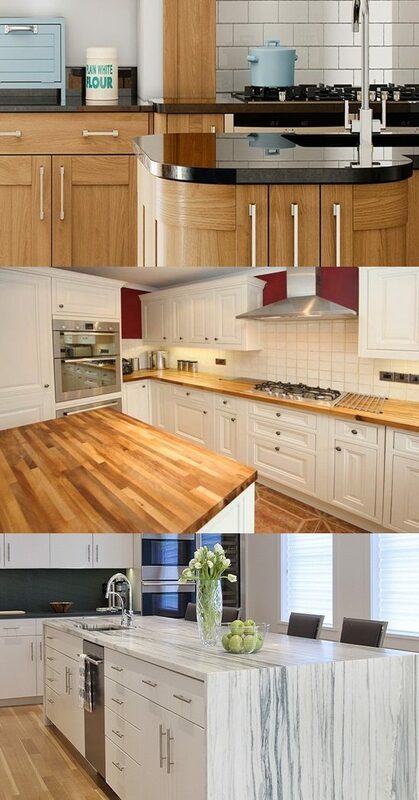 There are many kinds of rich wood for kitchen worktops, such as Walnut, Zebrano, and Cherry. If you are interested in the country theme, go for the butcher block worktop with its warm, natural look.